We are comfortably relaxed in the knowledge that many animals are vegetarians; it may be a little more difficult to accept the fact that, widely scattered over the world, there are number of plants that are carnivorous, or at least insectivorous. We cannot help feeling that this is rather shocking behaviour on their part, and the fact that various pitcher-plants inhabiting a great part of the world from North America to Northern Australia have a highly coloured and uncorseted appearance confirms us in a secret conviction that they are no better than they should be. If, however, we were to pick a Sundew (Drosera rotundifolia) flower which is like a small white saxifrage, or a butterwort, which resembles a violet, and we are to examine these flowers apart from their cunning and ingenious insect-trapping leaves, we should think that they were ‘nice’ flowers indeed. This small, carnivorous (insect-eating) plant is found widely throughout Europe and in Britain, where it grows in the poor, acidic soils of bogs, damp uplands, moorlands and woodlands. It is a small perennial herb growing up to 8 inches tall and needs to trap insects for extra nutrients as the soil in which it grows is so poor. It is remarkable for its leaves, which are covered with long red hairs, each with a small, fluid-containing gland at the top. When the sun shines on the leaves it resembles dew, hence the name “Sundew”. The genus name “Drosera” comes from a Greek word meaning “dew”. An insect landing on the leaf is trapped because this curls over inwards, and the sticky fluid (Sap) secreted by the hairs holds it fast. The secretion contains proteolytic enzymes that digest the body and the nutrients absorbed by the plant! The small white flowers of Sundew are fully opened in early morning but close up when the sun shines strongly. 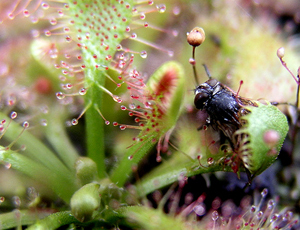 As early as the 13th century, alchemists noted positive results from the use of Sundew’s sap in the treatment of consumption, or tuberculosis. In 16th century John Gerand, England observed in his “Herbal” “Physicians have thought this herb to be rare and a single remedy for consumption of the lungs”. Today herbalists recommend Sundew sap for soothing coughs due to irritation and prescribe it for antispasmodic properties and it would also help in stopping cough, as in case of whooping cough. It was noticed that sheep which inadvertently cropped Sundew, developed a paroxysmal type of cough .It was investigated and proved as a remedy for this (whooping cough-pertusis) illness in Homoeopathy, and the whole plant is used to prepare the medicine. Any condition in which there is a violent, dry, persistent barking cough of a spasmodic nature as in whooping cough, benefits from the use of Sundew, which has a particular action on the upper respiratory tract. Accompanying symptoms are gagging, sickness, sweating and nosebleeding. It is also used to treat bronchitis, asthma, corns and warts growing painful and pain in the bones. The symptoms are worse from being too warm in bed, after midnight, while crying, lying down, laughing, singing, and talking. Symptoms improve out in the fresh air, with walking or gentle exercise, sitting probed up in bed, with pressure applied to the painful part and quite surroundings. Drosera rotundifolia was introduced in our Materia Medica by Dr. S. Hahnemann.He, in the Fragmenta, (1805) wrote 40 symptoms, in the 1st edition of the Materia Medica Pura (1811) 279 symptoms and in the IInd edition of Materia Medica Pura (1823) 287 symptoms.Dr.Hahnemann was aided in this proving by Gutmann, Friedrich Hahnemann, Langhamer and Wislicenus.Drosera became famous as a remedy for whooping cough by Hahnemann’s own recommendation based on observation of Wislicenus, one of the provers.Hahnemann says , “a single dose is quite sufficient for the homoeopathic cure of epidemic whooping cough, according to the indications given by symptoms 135,137,144,149, but especially 145 and second part of symptom 143”. Lastly, some interesting notes about Drosera. The famous English Naturalist Charles Robert Darwin(1809-1882), found that the Sundew can be excited when a piece of thread is laid on it weighing no more than 1/78,000 of a grain. The highest sensitiveness character of Sundew exactly appear in our Materia Medica as a proving symptom, i.e. “Pain as from bruise, excessively distressing sensitiveness, paralytic weakness in all limbs”. A delightful belief was that silver when put into the distilled water of Sundew turned to gold. In Ayurvedic system of medicine, Drosera plant is used in the preparation of gold bhasma. Dr. P. F. Curie (1799-1853) a famous Homoeopath explained that he had slowly poisoned three cats with daily doses of Drosera. Diarrhoea at the commencement, and weakness of voice about six week later, and on post-mortem both lungs were studded with true tubercle bacilli. One cat’s mesenteric glands enlarged and another’s sub-maxillary glands, with the solitary glands of the large intestine.